This Property is 100 Pct. Non-Smoking. 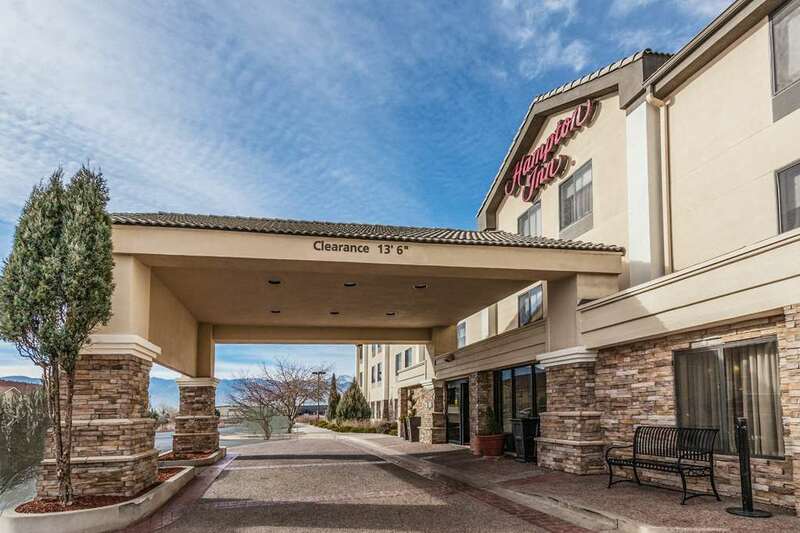 The Hampton Inn Colorado Springs - Airport hotel is 2.5 miles from Colorado Springs Airport and within 15 minutes of downtown Colorado Springs and other major attractions. The World Arena Olympic Training Center Garden of the Gods and Seven Falls are all within nine miles of our Hampton Inn hotel. Within two miles you can enjoy a day of shopping and dining out at any one of our tasty area restaurants such as The Olive Garden Red Lobster Texas T-Bone or Johnny Carino*s just to name a few. At the Hampton Inn Colorado Springs - Airport we offer 80 spacious newly-remodeled rooms fitness center indoor pool and whirlpool. Our other valuable amenities include Park n* Fly Packages our On The House/TM/ Hot Breakfast 24-hour business center in-room coffee makers hair dryers irons and ironing boards coin laundry and valet dry cleaning service.